Samsung companies have several series featuring Plus (+) series such as Samsung S8 and S8 +, Samsung A8 and A8 +, and the latest are Samsung S9 and S9 +. Plus differences indicate there are advantages or privileges compared to the regular series. Usually the Plus series has more specifications and features compared to the regular series, besides the price is more expensive. Here are the differences between Samsung Galaxy S9 and Samsung Galaxy S9 +. A significant difference and clearly visible from the screen, on the Samsung Galaxy S9 Plus has a wider screen dimensions with a size of 6.2 inches. While the Galaxy S9 carries a 5.8-inch touch screen. For screen technology both have used Super AMOLED. The screen resolution is also the same, namely 2,960 x 1,440 resolution (Quad HD +) the same ration which is 18.5: 9. In terms of Samsung S9 + Screen is bigger than the Samsung S9 series. Next is what most smartphone users ask, the capacity and stability of the battery. Samsung Galaxy S9 Plus has a battery capacity of 3,500 mAh. While the Galaxy S9 battery capacity is smaller, which is 3,000 mAh. The battery difference in both Samsung Smartphone series is quite striking. The quality of the camera to take pictures or videos, the Galaxy S9 Plus is equipped with dual cameras in the back. While the Galaxy S9 only has one camera at the back. The Samsung Galaxy S9 Plus consists of a wide-angle Dual Pixel 12 MPix sensor, with apertures f / 1.5 and f / 2.4. The other camera is 12 MPix telephoto lens with apertures f / 2.4. Whereas in the rear body of the Galaxy S9 there is a Dual Pixel 12 MPix sensor with f / 1.5 and f / 2.4 apertures. For the front camera, the two cellphones are equipped with an 8 MPix AF sensor with an f / 1.7 aperture. Both of these series have good quality for taking pictures and videos. Samsung S9 and S9 + smartphones have the same processor, but different RAM capacity. Samsung Galaxy S9 Plus has 6 GB RAM capacity. While the Galaxy S9 is equipped with 4 GB of RAM. The Galaxy S9 + has faster performance and performance because it has a 6GB RAM. Dual Camera on the back body of the Galaxy S9 Plus are both equipped with Dual OIS or Optical Image Stabilizer features. While the Galaxy S9 only has one camera with the OIS feature. This feature will make the photos or video recordings still look stable or not shake, even when shooting incorrectly. The OIS feature is able to minimize the effects of shocks on the results of photos or videos. Size that shows the level of screen density, the Galaxy S9 Plus has a size of 529 ppi. While the screen on the Galaxy S9 reaches 570 ppi. For PPI Samsung S9 is superior compared to Samsung S9 +. The higher the PPI, the better the display and color of the screen. A good smartphone is that it has many lightweight features that make it easy for users to hold. Galaxy S9 Plus weighs 189 grams, while the Galaxy S9 is more rinngan weighing 163 grams. That's the difference between Samsung S9 and Samsung S9 +, hopefully it's useful and a reference for you. Thank you for visiting the ToveweXYZ Website. 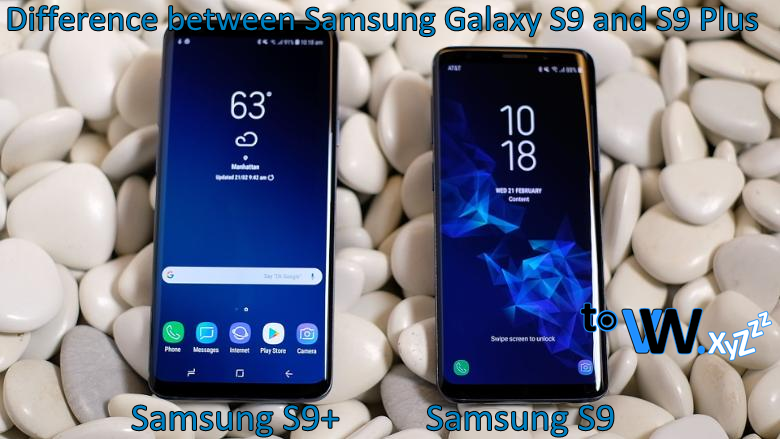 Keyword Search: Samsung Galaxy S9 and Samsung Galaxy S9+ Plus, Difference Samsung Galaxy S9 and Samsung Galaxy S9+ Plus, Comparison of Samsung Galaxy S9 and Samsung Galaxy S9+ Plus, Specifications Samsung Galaxy S9 and Samsung Galaxy S9+ Plus, Information Samsung Galaxy S9 and Samsung Galaxy S9+ Plus, Explanation Samsung Galaxy S9 and Samsung Galaxy S9+ Plus, About Samsung Galaxy S9 and Samsung Galaxy S9+ Plus, Complete Information Samsung Galaxy S9 and Samsung Galaxy S9+ Plus, Details Samsung Galaxy S9 and Samsung Galaxy S9+ Plus, What is the Difference Samsung Galaxy S9 and Samsung Galaxy S9+ Plus , How is the Difference and Comparison of Samsung Galaxy S9 and Samsung Galaxy S9+ Plus, iPhone XR Review Iphone XS and iPhone XS Max, See the Difference Samsung Galaxy S9 and Samsung Galaxy S9+ Plus, Significant Difference between Samsung Galaxy S9 and Samsung Galaxy S9+ Plus, Apple Samsung Galaxy S9 and Samsung Galaxy S9+ Plus.